Description: This is a woody perennial vine up to 50' long. It usually climbs trees, shrubs, or fence rows through the use of tendrils, but will rise only ½–2' above the ground while sprawling in open areas. The woody stems branch occasionally, and can become quite thick with shaggy bark toward the trunk. The smaller non-woody stems are yellowish green to red, hairless, and sometimes glaucous. At the leaf nodes, these stems become slightly wider, where there is a thin partition about 0.5-1.5 mm. across in the pith. Usually the tip of an actively growing stem is covered by a pair of young leaves. The leaves are up to 6" long and 4" across; they alternate along the stems. The leaves are cordate or orbicular in overall shape, and palmately lobed (often only three lobes are clearly visible). Usually the sinuses between the major lobes are broad and shallow, although sometimes they are moderately deep and either narrowly U-shaped or sharply cleft. The margins are coarsely serrated and slightly ciliate. The lower leaf surface is pale green, where there are white hairs along the major veins. The upper leaf surface is yellowish green to dark green and glabrous. The long slender petioles are pale green to red and usually glabrous, although there is a variety of Riverbank Grape with pubescent petioles. The flowers develop in drooping panicles up to 5" long. The small greenish-yellow flowers are either unisexual or perfect with 5 deciduous petals. Male flowers have 5 long exerted stamens, while female flowers have an ovary with a short style. Perfect flowers have both kinds of reproductive organs. Along with the tendrils, the panicles of flowers develop oppositely from the leaves, except every third one. The blooming period occurs during the late spring and lasts about 2 weeks. The flowers have a sweet musky fragrance. They are replaced by berries that develop during the summer. These are initially small and green, but become 3/8" across at maturity during late summer or fall. Mature berries are dark violet with a whitish bloom, each one containing 1-4 seeds. They have a juicy interior and either a sour or sweet-tart flavor. The root system consists of a central taproot that branches occasionally. Cultivation: The preference is full sun to light shade, and moist to slightly dry conditions. This plant is not particular about soil texture, which can contain significant amounts of loam, sand, or gravel. It can be difficult and slow to start plants from seed, so stem cuttings or transplants are recommended as methods of propagation. 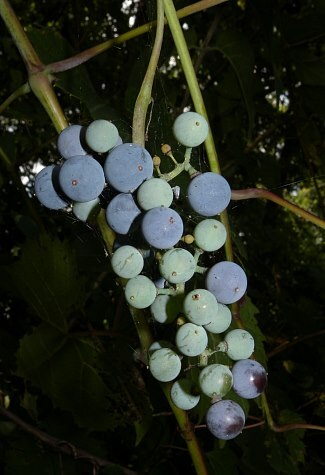 Like other wild grapes, this plant can smother and kill shrubs and small trees. Range & Habitat: The native Riverbank Grape occurs in most of Illinois, except for a few southern counties (see Distribution Map). It is occasional to common in most areas. Habitats include moist to mesic black soil prairies, woodland edges and openings, sandy woodland edges and openings, savannas and sandy savannas, sand dunes, thickets, powerline clearances, fence rows, abandoned fields, gravelly areas along railroads, and areas along rivers, lakes, and ditches. In prairie habitats, this plant is usually near sources of water, woodland borders, or disturbed areas. Recovery from wildfires is poor. Faunal Associations: In general, wild grapes are very valuable as a source of cover and food to many insects and animals. Bumblebees, small bees and flower flies visit the flowers, where they seek pollen primarily. The caterpillars of many moths, particularly Sphinx moths, feed on the foliage and other parts of this plant (see Moth Table). Other insects feeding on this plant include aphids, leafhoppers, beetles, midges, mites, thrips, and scale insects. Japanese Beetles (Popillia japonica) are particularly fond of the foliage of Riverbank Grape, and can cause major damage. The fruit is an important source of food to upland gamebirds and many songbirds (see Bird Table). Several mammals consume the fruit, including the Black Bear, Gray Fox, Opossum, Raccoon, Striped Skunk, Spotted Prairie Skunk, and Fox Squirrel. These birds and mammals help to distribute the seeds far and wide. Occasionally, the Cottontail Rabbit and White-Tailed Deer browse on the foliage and stems. Photographic Location: The photographs were taken along a shrubby border at Crystal Lake Park in Urbana, Illinois. Comments: This is probably the most common wild grape in Illinois, and the species most likely to be found in prairie remnants. Distinguishing different species of wild grape can be difficult. Riverbank Grape has the following characteristics that together set it apart from the others: 1) The underside of the leaves is hairless, except along the veins, and never whitened; 2) the stems are usually hairless; 3) at the nodes of the leaves, there is a partition in the pith of the stem that is more narrow (0.5-1.5 mm. across) than the partition of other Vitis spp. 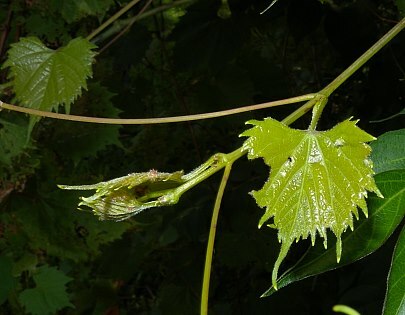 ; 4) the tips of the stems are usually covered by a pair of newly formed leaves, instead of being exposed and visible; and 5) often the teeth of the leaves are more narrow and pointed than those of other Vitis spp. 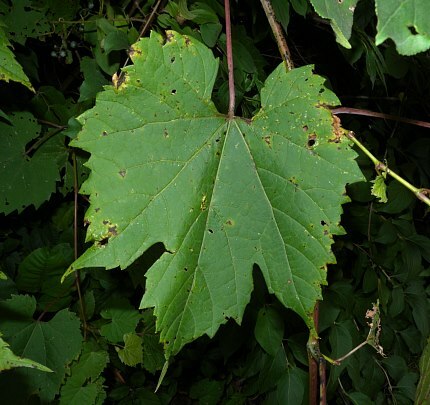 There is a variety of Riverbank Grape, Vitis riparia syrticola, that has pubescent petioles and stems; it is also more conspicuously hairy along the veins of the leaf undersides. This variety of Riverbank Bank is less common within the state than the typical variety.